FRANKLIN, Tennessee, April 12, 2011 (ENS) – Nissan is investigating customer complaints that its new all-electric LEAF will not restart after being turned off. Without saying how many complaints have come in, Nissan acknowledges that drivers in both Japan and the United States have reported the problem. Currently, there is no intention to require a recall since the problem is not affecting the safety of the vehicle. According to Nissan, the defect may originate with a sensor in the air conditioning unit. “If this sensor is activated it will illuminate a warning light on the instrument panel and may cause the vehicle to not restart once it has been turned off,” the company said. 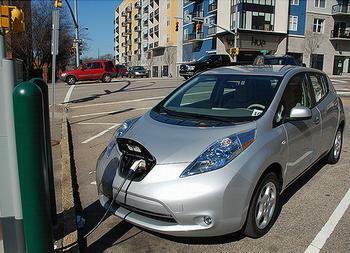 The restart failure is the latest setback for the Nissan battery-powered electric car. The LEAF was rolled out slowly to minimize potential quality problems in the earliest stages. Then Nissan was forced to halt production for a month due to the earthquake, tsunami that struck Japan on March 11 and the resulting power shortages. While many customers who pre-ordered their LEAFs are still waiting more or less patiently, Nissan had sold only 3,484 in Japan and 471 in the United States by the end of March, according to company figures. Before the March 11 earthquake and tsunami, Nissan officials had promised to start increasing production and eliminating back-orders by May. Finally, the company may be able to start fulfilling its promise. Nissan’s Oppama plant, currently the only site where Nissan manufactures the LEAF, started production again on Monday.